Research work on any topic in any subject com prises of the massively industrious efforts on the part of the researcher and the outcome of the hard labour involved therein needs to be viewed with immense esteem, even in the braggart freedom of our thought. Since Astrology, as of date, is an unregulated subject many claimants of fresh research can be seen, majority of whose works are nothing but a bundle of obscurations. Although quite unpopularly popular for the lambasting language used at times the scribe does not intend to become particular with any such efforts that normally lead the readers to some viewless vast of incongruities. Our endeavours need to be appropriately and comprehensively collated with the result in terms of its freshness and active applicability. Perhaps this is the reason that that the scribe himself has never claimed to be a researcher in the field of astrology in spite of the fact that few rare things/principles have been brought to fore for the first time by him. The Tara Dasa being discussed hereunder is just another example of such labour of the scribe. As a matter of fact the scribe in his quest for obsolete and unknown Dasa systems from the pandits residing in far flung corners of our vast country came across with five types of Dasa - all being called as Tara Dasa but differed completely in method of computation. In the subsequent essays some more unknown Dasa such as Bhuvaneshwari Dasa, Maheshwar Dasa, Karak-Navamsha Dasa etc shall be discussed that the scribe learnt from different sources, mainly from Tantrik scholars who were also great adepts in the science of astrology. The current technique of calculating Tara Dasa was learnt from a Tantrik - Astrologer whom the scribe met with in Kanak Durga temple at Vijayavada (AP) and latter became his disciple. This is basically a Rasi Dasa and its description is not found in any of the known standard classical works of astrology. But the astrology is such an old subject that many principles and techniques are still quite unknown. Every one was quite surprised when few rare techniques/predictive tools were unearthed by late C S Patel from Deva-Keralam and other Nadi texts viz. Bhrigu Bindu and Sun-Mercury-Venus arc; now rechristened after his name as CSP Arc by few of his disciples. As such, the discerning readers are requested to apply and test the efficacy of this Dasa by themselves on several charts and see the results. Even if it works on 40% cases its efficacy stands proved as there is no single Dasa system dealt in the texts that can deliver more than 60% accurate results. There is also another type of Rasi Dasa under the same name of Tara Dasa which is a conditional Dasa and the same would be discussed separately in the subsequent issue of this journal. This Dasa takes the lead from VDS (Vimshottari Dasa System) for initiating the process of computation but does not follow the course of VDS and finally gets converted into a Rasi Dasa. Thus it begins from Graha (planet) and moves to Rasi (sign) for delineation of effects which is quite noteworthy because it comprises of the blending of pulsations from planets and signs. It is not a conditional Dasa and can be applied freely on any natal chart. In this Dasa System, first of all, Tara Lagna is calculated with the help of elapsed period of the planet operating at birth in VDS. The Dasa commence from the sign identical with Tara Lagna or the 7th sign reckoned therefrom; whichever is stronger between the two. The Tara Lagna for this and another type of Tara Dasa (Rasi type) as mentioned above is calculated differently and; as such, the students need not get confused in this respect. Evaluation of Tara Lagna: Following steps are taken to work out the Tara Lagna in any birth map for this (type of) Tara Dasa 1. 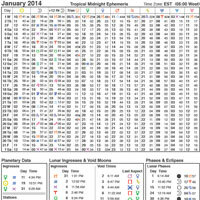 Note down the planet operating at birth as per VDS and find out the sign occupied by that planet in the natal chart. These are called Stambh Graha and Stambha Rasi respectively. 2. Note down the elapsed period of that planet at birth as per Vimshottari Dasa System (VDS). 3. Exclude the number of years elapsed at birth and convert the months into days considering 30 days in each month. 4. Divide the total number of days thus obtained by the Maha Dasa period of that planet (Stambha Graha) as given in VDS. 5. Add one in the quotient and expunge 12 or its multiple in case the quotient is more than 12. 6. Count as many sign away in direct or reverse order from the sign occupied by the planet operating at birth (stambha graha) as per VDS i.e. from stambha Rasi. 7. The sign thus obtained is known as Tara Lagna and the 7th sign reckoned from there is called Prati-Tara Lagna. 8. 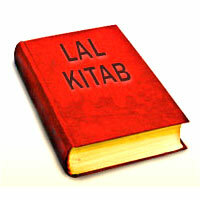 The Tara Dasa shall commence with stronger between Tara Lagna and Prati-Tara Lagna. 9. Remainder is used to work out the balance period of Tara Dasa at birth. Counting for Tara Lagna : The counting as suggested at point 6 above is made from the Stambha Rasi. If this sign is placed in the bright half of the horoscope that is from Janma Lagna (birth ascendant) to 8th house the counting would be direct. In case the Stambha Rasi is located in the darker half that is between 2nd to 7th house, the counting shall be in reverse order. It is quite inexplicable to take bright and dark half of the horoscope for reckoning because it does not straight a way say about day or night births; albeit, the rational seems to be hinged on the same concept only. Why the link with VDS for computation of Tara Lagna has been kept is also not known. Few such oddities can be clearly observed in this system but it is hard to give reasons for any Dasa and its pattern of operation. Order of Dasa (Main Period) : Tara Lagna and Prati-Tara Lagna are determined as per the procedure described above and their respective strength is evaluated. The Tara Dasa would begin with the stronger between the two. After that the order of other signs are to be determined which depends upon the odd or even nature of the sign with which the Dasa has commenced. If the Dasa commencing sign is odd the order of Dasa would run in direct manner or zodiacal and if it is an even sign the Dasa would proceed in reverse way. Judgement of Strength : Stronger of the Tara Lagna and the Prati-Tara Lagna is taken here for the commencement of Dasa but the criteria for assessment of the strength is completely baffling because it is decided on the basis of Argala. Out of the two houses under consideration here whichever has better Argala is deemed stronger in this case. This is a unique approach in working out the comparative strength of the two houses. Since the use of Argala for the purpose of evaluation of strength is found no where the scribe could not remain silent and wanted to know the rationality but his preceptor could not also provide a convincing answer. It is presumed that Argala stops the dissipation of energy from any house and thereby it becomes stronger in comparison to the house which is not equipped with Argala because the free drainage of energy renders it weak. That can be the only possible reason for considering the Argala for evaluation of strength of a house. This; however, indicates the importance of Argala in the horoscope. The scribe personally feels that the judgement of the strength of the house should be made on the basis of the provisions available in Jaimini Astrology but here the discussion is confined strictly to what was taught to him (scribe) by his preceptor. This technique has been used on several birth charts over many years and satisfactory results have been obtained. Hence only Argala shall be considered here for the evaluation of comparative strength between the Tara Lagna and Prati-Tara Lagna to decide the commencement of Dasa. Concept of Argala : The planet occupying 2nd, 4th and 11th positions reckoned from any house constitute Argala for that house. The planets placed in 12th, 10th and 3rd position from a house works to destroy or obstruct the Argala of that house. If the 3rd position is occupied by three malefic planets it forms Argala for that house. Similarly the planets located in 5th position produce Argala and it is obstructed by the planets placed in the 9th position from the house under consideration. If house has Argala from three positions and obstruction from two positions it shall be deemed as having Argala. If the Argala producing houses have more number of planets than the obstructing place, the Argala is considered to be operative. The Argala produced from 3rd position is called Nirbhasargala. 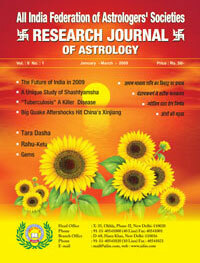 For more details the readers may please refer to “Musings on Jaimini Astrology” by the scribe. Duration of Dasa & Antar-Dasa : Each sign has a duration of 9 years in main period and 12th part of the same that is 9 months is the duration of Antar-dasa for each sign. Thus the total Dasa period in this system of Tara Dasa is 108 years. Order of Antar Dasa or Sub-periods : The order of signs in sub-period again depends upon the location of Stambha Graha in sampad or visampad rasi. Sampad rasis are Cancer, Leo, Virgo, Capricorn, Aquarius and Pisces and the visampad rasis are Aries, Taurus, Gemini, Libra, Scorpio and Sagittarius. If the Satambha graha is situated in the odd sign of visampad group of rasi the sub-period would run in direct order but if in even sign of same group it would be in reverse way. Similarly the Antar- Dasa would be direct if the stambha graha is located in the even sign of the Sampad group and would run reverse if placed in the odd sign of the same rasi-group. Here due care needs to be taken as it is not exactly as per suggestions found elsewhere in Jaimini. It should also not be mistaken as a Jaimini Dasa. Now let us see the application of this Dasa on few charts. Examp. No. 1 : This is the horoscope of former PM AB Vajpayee and his birth particulars are as under: DOB: 25-12-1924; TOB: 04.00 Hrs;POB: 78E10:26N13 Planetary Positions : Lagna-Libra29d06m03s;Sun-Sagittarius10d04m16s; Moon-Scorpio22d40m14s Mars-Pisces10d29m26s;Mercury(R) Sagittarius 15d47m09s; Jupiter- Sagittarius 08d43m26s; Venus-Scorpio11d03m05s; Saturn-Libra18d39m07s; Rahu - Cancer 21d36m52s: Ketu-Capricorn21d26m52s Navamsha : Lagna- Gemini; Sun-Cancer; Moon-Capricorn; Mars-Libra; Mercury-Leo; Jupiter-Gemini; Venus-Libra; Saturn-Pisces; Rahu-Capricorn; Ketu-Cancer. Planet operating at birth - Mercury; Balance of Dasa- 09yr 04month 05days, Mercury is placed in Sagittarius; As such; Stambha Rasi - Sagittarius and Stambha Graha - Mercury. Elapsed period of Mercury at birth - 07yr 07month 25 days Excluding years, total number of days; 7 X 30 + 25 = 235 days Dasa Period of Mercury - 17 yrs; After dividing 235 by 17, we get Quotient - 13; and Remainder - 14 Add one to quotient ; 13+1 = 14 Expunge multiples of 12; 14-12 = 2 Stambha Graha Mercury is placed in the darker half of the natal chart. So the counting from the Stambha Rasi (Sagittarius) shall be reverse. Counting two signs away from Sagittarius in reverse direction gives Scorpio. Therefore; Scorpio is the Tara Lagna and Taurus is Prati-Tara Lagna. Readers may note that sign Scorpio being Tara Lagna is supposed to be playibg quite effective role in the life of the native and many astrologers believe that he (Vajpayee) was born in Scorpio Lagna on the basis of certain qualities observed in him. Dasa would start from the stronger of the Scorpio and Taurus. This shall be decided on the basis of Argala here SN	Argala Position	Tara Lagna	Prati-Tara Lagna 1	2nd place	Jup, Sun, Mer NIL	2	4th place	NIL	NIL	3	11th place	NIL	Mars	4	5th place	Mars	NIL	It is obvious from above table that Argala formed to Tara Lagna (Scorpio) is more potent than Argala produced to Prati-Tara Lagna (Taurus) and therefore; Tara Dasa would start with Tara Lagna i.e. Scorpio. Since Scorpio is an even sign the Dasa would start in reverse thet is Scorpio, Libra, Virgo, Leo etc. Here the concept of Sampad and visampad group does not apply. They are used for the order of Sub-periods. Balance Of Tara Dasa at birth : In the above calculation, the remainder obtained was 14. So, the Ratio; 14/17 = 0.823529 As such; Dasa balance at birth; 9 X 0.823529 = 7.41176 yrs = 7 Yrs 04 month 28 days Date of birth	25 - 12 - 1924 28 - 04 - 0007	Scorpio Dasa 23 - 05 - 1932 00 - 00 - 0063	upto Aries Dasa (7 X 9) 23 - 05 - 1995 Pisces Dasa started from 23-05-1995 and Vajpayee became PM in March 1998. Let us see the Antar-Dasa or Bhukti (sub-period) details. As Stambha Graha Mercury is placed in the odd sign (Sagittarius) of Visam pad group, the sub-period would run direct 23 - 05 - 1995 00 - 09 - 0000	Pisces-Pisces 23 - 02 - 1996 00 - 27 - 0000	Pisces-Aries, Taurus,Gemini 23 - 05 - 1998 00 - 09 - 0000	Pisces - Cancer 23 - 02 - 1999 00 - 09 - 0000	Pisces - Leo 23 - 11 - 1999 Vajpayee first became during Gemini Bhukti wchich signifies luck in his horoscope. He again became PM in October 1999 when Leo Bhukti was in operation and to true to the quality of gain (11th house) the post of PM was regained. Examp. No. 2 : Here is the horoscope of Smt. Indira Gandhi. Her Birth particulars are as under : DOB: 19-11-1917; TOB: 23:11 Hrs; POB: 25N27:81E51 Planetary Positions: Lagna-Cancer27d22m22s;Sun-Scorpio 04d07m31s; Moon-Capricorn05d35m17s Mars-Leo16d22m30s; Mercury-Scorpio13d13m46s; Jupiter(R) Taurus 15d00m06s Venus-Sagittarius 21d00m19s;Saturn-Cancer 21d47m14s; Rahu-Sagittatius09d12m17s; Ketu- Gemini 09d12m17s Navamsha : Lagna-Pisces; Sun-Leo; Moon-Aquarius; Mars-Leo; Mercury-Libra; Jupiter-Taurus; Venus-Libra; Saturn-Capricorn; Rahu-Gemini Ketu-Sagittarius Sun was operating at birth in VDS and it is placed in Scorpio. Hence Stambha Rasi - Scorpio; Stambha Graha - Sun Balance of Sun Dasa at birth - 01 yr 11month 26days. As such; Elapsed period - 04yrs 00month 04days Total number of days, excluding years - 04 days After dividing it by Dasa period (6) of Sun, we get quotient - 0; remainder - 04 Add one to quotient : 0 + 1 = 1 Hence Scorpio is Tara Lagna and Taurus is Prati-Tara Lagna; The Dasa would start with the stronger between these two SN	Argala Position	Tara Lagna	Prati-Tara Lagna 1	2nd place	Venus, Rahu	Ketu	2	4th place	NIL	Mars	3	11th place	NIL	NIL	Prati Tara Lagna Taurus has Argala from two positions and hence it is strong. The dasa would start with Taurus. As Taurus is an even sign the Dasa would run reverse i.e. Taurus, Aries, Pisces etc. Balance of Tara Dasa : Remainder is 4. Hence ratio = 4/6 Dasa balance at birth = 04/06 X 9 = 6yrs 00month 00 days Her Gruesome assassination took place in October 1984. Date of birth	19 - 11 - 1917 00 - 00 - 0060	upto Scorpio Dasa (6+54) 19 - 11 - 1977 Libra Dasa started from 19th of November 1977. Libra is identical with the 4th house and in astrology the 4th house also defines the exit from this world because it is the place for realisation of the attributes of the 8th house that is death. Let us see in Bhukti (sub-period) which sign was actually operating to bring about this process of exit. 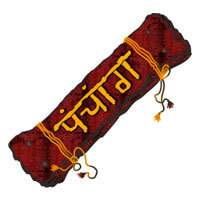 Stambh Graha Sun is situated in Scorpio which is the even sign of the Visam Pad group and hence, the Bhukti would run in reverse order i.e. Libra-Libra; Libra-Virgo; Libra-Leo etc Aquarius Bhukti in Libra Dasa ended on 19-08-1984 and there after Capricorn (killer) Dasa came in operation Commencement of Libra Dasa	19 - 11 - 1977 Upto Aquarius Bhukti(81 months)	00 - 09 - 0006 19 - 08 - 1984 00 - 09 - 0000 19 - 05 - 1985 Capricorn being identical with the 7th house is imbued with strong killer currents and under the Dasa of Libra (4th house) it became potentially dangerous. Example No. 3 : Here is the horoscope of a native who was a high positioned executive but was suspended from the job on some serious charges of corruption in July 2005. He is still under suspension and the inquiry is in progress. His birth particulars are as under BOB: 01-07-1961, TOB: 13:49Hrs, POB: 72E50;18N58 Planetary Position: Lagna-Libra 01d52m40s; Sun-Gemini 15d55m54s; Moon-Capricorn 25d18m33s Mars-Leo 08d04m18s; Mercury(R)-Gemini 10d05m33s; Jupiter(R)Capricorn 11d49m30s; Venus-Taurus00d38m19s; Saturn(R) Capricorn04d31m35s Rahu-Leo04d51m47s;Ketu-aquarius04d51m47s Navamsha : Lagna-Libra; Sun-Aquarius; Moon-Leo; Mars-Gemini; Mercury-Capricorn Jupiter-Aries; Venus-Capricorn; Saturn-Aquarius; Rahu-Taurus; Ketu-Scorpio. Mars was operating at birth and it is placed in the sign Leo. Hence stambha Rasi - Leo; Stambha Graha - Mars. Balance of Mars Dasa at berth as per VDS - 05yrs 11months 07days Elapsed period of Mars - 01yr 00month 23days Ignoring the year total number of days - 23 After dividing it by Dasa period(7) of Mars we get Quotient 3 and remainder 2. Add one in quotient; 3 + 1 = 4 Stambha Graha Mars is located in brighter half. hence counting from the Stambha Rasi would be direct. It gives Scorpio sign. As such; Scorpio is Tara Lagna and Taurus is Prati-Tara Lagna. Dasa will start from the stronger between these two SN	Argala Position	Tara Lagna	Prati-Tara Lagna 1	2nd place	NIL	Sun, Mercury	2	4th place	Ketu	Mars, Rahu	3	11th place	NIL	NIL	The Argla of Prati-Tara Lagna is strong and therefore; Tara Dasa start with Taurus. Since Taurus is an even sign, the Tara dasa would run in reverse order. Balance of Tara Dasa : Remainder is 2; hence Ratio 2/7 = 0.2857, Dasa balance at birth - 9 X 0.2857 = 02yrs 06months 26days The native was suspended from job in July 2005 when Sagittarius Dasa was in operation. Sagittarius is identical with 3rd house and is aspected by Rahu. Hence it is severely imbued with the currents of damage and destruction. Date of birth	01 - 07 - 1961 Taurus Dasa	26 - 06 - 0002 27 - 01 - 1964 Upto Capricorn Dasa	00 - 00 - 0036 27 - 01 - 2000 Sagittarius Dasa started from 27th of January 2000. Let us see the Bhukti of sign that caused the manifestation of this event. Stambha Graha Mars is placed in Leo which is an odd sign of the Sam pad group. Therefore; Bhukti would run in reverse order i.e. Sagittarius, Scorpio, Libra etc. Start of Sagittarius Dasa	27 - 01 - 2000 Upto Gemini Bhukti	00 - 03 - 0005 (7 X 9 = 63 months)	. . 27 - 04 - 2005 The Taurus Bhukti started from 27th April 2005 and the suspension from job occurred in July 2005. Taurus sign is identical with 8th house, hence is capable of producing bad events like defeat, defamation, insult, injury etc. The event has occurred in line with the same. We may note here one interesting point with respect to VDS, just for comparison. In VDS luck lord Mercury was operating under the Dasa of Yoga Karka Saturn. As such, occurrence of such bad event as per VDS can be quite baffling. But Tara Dasa gives the clue as it shows the play of destructive vibrations emanating from two bad houses 3rd and 8th. Thus, possibility of bad events was almost unavoidable. The method of calculation of this Dasa has been explained in detail and more examples are with held as they can only increase the length of this essay. Readers may try this Dasa and find out its efficacy by themselves. The scribe is using this Dasa since many years and has got quite encouraging results.